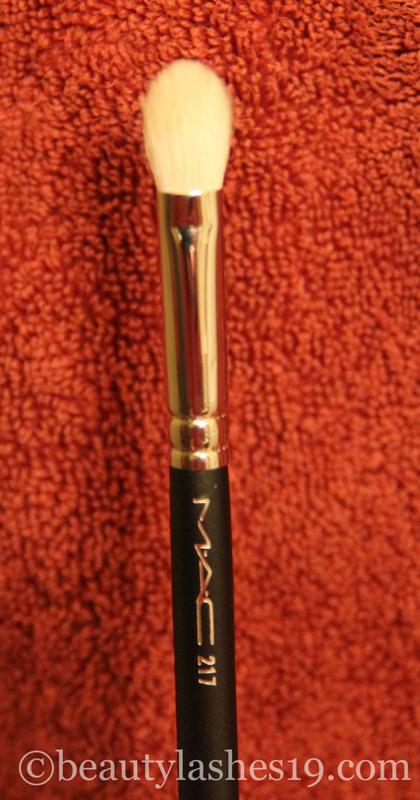 Today I am reviewing the very well known MAC 217 blending brush.. It is quite pricey at $24.00 USD but I finally gave in and purchased it.. I have wanted it forever (well, atleast for 4-5 years now)! The brush is as described.. It is oval in shape and is quite dense despite being made up of very fine hairs.. This makes it great for blending both concealer and eyeshadows alike.. The shape of the brush makes it great for depositing color into the crease of the eye or for applying concealer under the eye.. If the brush is turned onto its side, it makes for great blending.. Overall, I feel this brush is very versatile and can be used for various purposes.. Will I pay another $24 for this brush? hmmm… Maybe not.. but its a good addition to my existing brush collection.. I feel it can be replaced by the Real Techniques base shadow brush or the Sigma E25 brush (although this one has more splayed/spread out brush fibres)..